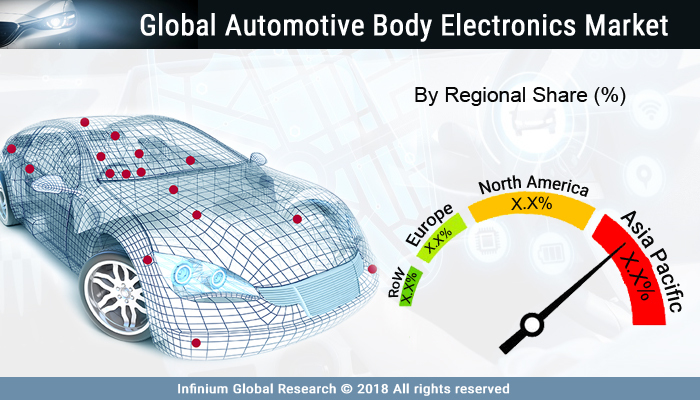 A recent report published by Infinium Global Research on automotive body electronics market provides an in-depth analysis of segments and sub-segments in the global as well as regional automotive body electronics market. The study also highlights the impact of drivers, restraints, and macro indicators on the global and regional automotive body electronics market over the short term as well as long term. The report is a comprehensive presentation of trends, forecast and dollar values of the global automotive body electronics market. According to the report, the global automotive body electronics market is projected to grow at a healthy CAGR of over the forecast period of 2018-2024. Automotive body electronics contains a wide range of system that provides control functions to implement diagnostics and safety features, and manage power. They offer a wide array of power switching & monitoring circuits, sensors, and sensor interface and communication ICs for automobile body electronics. Drivers today are looking for new levels of comfort, safety, efficiency and consumer features in their vehicles. Central body control systems manage all of the safety, power management, and diagnostic systems on the vehicle. Body electronics systems hold a wide variety of applications, addressing everything from driver and passenger comfort and security to high-performance computing and in-vehicle networking. Increase in demand for vehicle comfort and increasing production drives the growth of the automotive body electronics market. In addition, government laws regarding pollution and demand for ADAS equipped vehicles are fuelling the growth of the automotive body electronics market. Now a day’s functional safety design support increasingly expected as the OEM’s are looking to optimize seat position, close windows and roof systems based upon input from vehicle sensors. Furthermore, the reduction in fuel consumption and emissions is increasing rapidly with the introduction of the start-stop system in the vehicle that automatically shuts down and restarts the IC engine reduces the fuel consumption. However, malfunctioning of the system and the high cost of the components of body electronics are likely to hamper the growth of the automotive body market. Furthermore, the introduction of the new inbuilt technologies in the car features are anticipated to create several growth opportunities for the key players in the automotive body electronics market. On the other hand, leveraging their technological advantages, many information technology companies have crossed over into the auto industry to promote the informatization and intelligent development of vehicles. Among the geographies, Asia Pacific dominated the global automotive body electronics market. The growth in the Asia Pacific region is due to the adoption of advanced technologies in countries such as India and China. Moreover, several automotive manufacturers from North America contribute to the economy of the countries through the electronics industry. On the other hand, Countries in Latin America such as Brazil are focusing on new technology vehicles. The report on global automotive body electronics market covers segments such as solutions, body features, and applications. On the basis of solutions, the global automotive body electronics market is categorized into central body control, instrument cluster, LiDAR systems, and RKE RF module. On the basis of body features, the global automotive body electronics market is categorized into windows and door modules, seating modules, roof module control, light control, energy or power management, wiper and mirror module, auto HVAC, and remote keyless entry. On the basis of applications, the global automotive body electronics market is categorized into chassis electronics, passive safety, driver assistance, passenger comfort, infotainment systems, and security. The report provides regional analysis covering geographies such as North America, Europe, Asia-Pacific, and Rest of the World. In this section, the key trends and market size for each geography are provided over the period of 2016-2024. The countries covered in the North America region include the U.S., Canada, and Mexico; while the Asia-Pacific region includes countries such as China, Japan, India, South Korea, Malaysia, and among others. Moreover, Germany, U.K., France, Spain, and Rest of Europe are the major markets included in the European region. The U.S. drives the growth in the North America region, as it is the largest market in the region. In the Asia-pacific region, rapid industrial growth in India and China offer substantial potential for the growth in the automotive body electronics market. As a result, the APAC region is projected to experience growth at a CAGR of x.x% over the forecast period 2018-2024. The report provides profiles of the companies in the global automotive body electronics market such as Robert Bosch GmbH, Infineon Technologies AG, OMRON Corporation, HGM Automotive Electronics, Delta Electronics, Inc., Hitachi, Ltd., Continental AG, ZF TRW, and Atotech Deutschland GmbH. The report provides deep insights into the demand forecasts, market trends, and micro and macro indicators. In addition, this report provides insights into the factors that are driving and restraining the global automotive body electronics market. Moreover, The IGR-Growth Matrix analysis given in the report brings an insight into the investment areas that existing or new market players can consider. The report provides insights into the market using analytical tools such as Porter's five forces analysis and DRO analysis of automotive body electronics market. Moreover, the study highlights current market trends and provides forecast from 2018-2024. We also have highlighted future trends in the automotive body electronics market that will affect the demand during the forecast period. Moreover, the competitive analysis given in each regional market brings an insight into the market share of the leading players. This report will help manufacturers, suppliers, and distributors of the automotive body electronics market to understand the present and future trends in this market and formulate their strategies accordingly.